Distractions have always played a role in causing accidents. Yet, the birth of the smartphone and our generation’s reliance on technology has caused distraction-created accidents to skyrocket. Teenager drivers are especially vulnerable to distractions and to car accidents. In fact, distractions are responsible for about 6 of every 10 moderate to severe crashes. 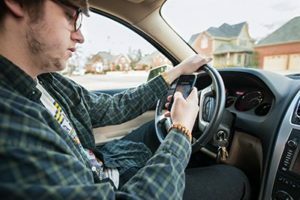 A new study released this month by the AAA Foundation for Traffic Safety uncovered some startling information about distracted teen drivers and the accidents that they cause. According to their data, all forms of distraction were a factor in 58% of all teenage crashes, including 89% of crashes where the vehicle left the road. In addition, distractions were responsible for up to 76% of all rear-end collisions. This is a far cry from the NHTSA’s estimation that distractions caused only 14% of all teenage accidents. What distractions are the worst for drivers? The main reason for those crashes was the driver interacting with someone in the vehicle (15%). Coming in a close second was using a cellphone to talk, text, or review the screen for messages (12%). Other forms of distraction that caused serious accidents included looking at something in the vehicle (10%), looking at something outside the vehicle (9%), singing or dancing to music (8%), and grooming (6%). By far passengers and cell phones are the most common forms of distraction and both of those are present when teenagers are driving. Even worse, teenage passengers are often loud, boisterous, and carry their own cell phones. This can make the situation even more distracting. When you combine these distractions with the fact that young drivers are inexperienced on the road, this is a recipe for disaster. Teen drivers have the highest crash rate of any age group, according to the AAA Foundation for Traffic Safety. In 2013 alone, 963,00 teenage drivers were involved in an automobile crash. Of these accidents, 383,000 were injured and 2,865 were killed. But I only glance at my phone for a second! Not really. The AAA study found that teenage drivers using cell phones had their eyes off of the road for a full 4.1 seconds. In addition, when teenage drivers were using their cell phones, they actually failed to reach more than half of the time before the impact. When you are injured in an accident that is caused by a distracted driver, your whole world can be turned upside down. It is natural to feel angry, depressed, and confused about what happened and how you will put your life back together again. At the Green Law Firm, we can help you and your family through this difficult time and review all of your legal options. Remember, the law is on your side. Contact the experienced Colorado Springs personal injury attorneys at the Green Law Firm today to schedule a no-obligation consultation and discuss your case. Call us today at 1-719-694-8515.